Create a delegate on the destination View Controller. Implement that delegate on the source View Controller. In the prepareForSegue method, set the destination VC’s delegate to be the source VC. When you want to “bounce back” you’d have to keep firing methods up the delegate ladder until you got to where you wanted to be. I don’t want to say that I’m lazy but putting all of this code into a sample didn’t make much sense. It clutters up the code and takes the focus away from what I want to actually demonstrate. I put a question out on Twitter asking how people would suggest pulling this off and received one interesting response from my fellow polyglot Sasha. His suggestion was to use something called an unwind segue. Right before he posted that response, I actually found a different, fairly straightforward, solution so I figured I would post about them both. I ran into a funny issue with the unwind segue that I didn’t find documented anywhere so I thought it would be a smart idea to put it up here. The first thing we do is call dismissViewController on the VC which will remove any modals. Next, we call the popToRootViewControllerAnimated method on the VC’s navigationController property. This removes all of the pushed VCs from the navigation stack. This all seems to work fine. I will point out that this might not work if you have several modals mixed in with different NavigationControllers. Though if you are doing that, you probably have a bigger problem on your hands. Here I can select the reset method I created before. Now when I run my app and tap on the button I connected, iOS will look back through my stack and call a method named canPerformUnwindSegueAction on each VC up the stack until it finds one that will respond. So in other words, it’s going to travel up the stack and say “can this view controller respond to the reset selector? No? ok I’ll keep going. Yes? Ok I’ll execute it and remove the other VCs in between!”. So when I tap the button, it will go back to the first VC. When I did this with the simple app I outlined above, everything worked fine. When I fired my reset Exit method from the VCs on the right side, things were returned to my root VC. All was good (and arguably better than what I outlined above). However, when I implemented the same thing in my more complex sample, it didn’t work. At first I thought it had something to do with the fact that I was trying to unwind from a Modal down through some pushed VCs to the root. However, even when I tried from somewhere that was just 3 pushed VCs in (i.e. no Modals) it didn’t work. In fact, each time, whether I was exiting from a modal or a pushed VC, only one VC was dismissed or popped. I was racking my brains until I thought, maybe I need to implement the canPerformUnwindSegueAction myself. So sure enough, after adding this method to all of the custom View Controllers I had implemented “in between” and returned NO (i.e. this VC won’t respond to the reset selector) things worked and it returned to the root VC properly. Today we looked at two different methods to return to a root view controller from somewhere down the navigation stack in your iOS apps. The first technique was all code based and required us calling a method on the root VC which then dismisses any models and then popping any pushed VCs. The second method uses a new technique called Unwind Segues which enables you to connect an action in Interface Builder to a Exit method in another VC. iOS will then handle traversing the stack and figuring out what VC to return to (with potentially a little help from you and the canPerformUnwindSegueAction method). Remember that the Unwind Segues are iOS 6 and up. Hopefully this helps some developers out there as much as it helped me. Great explanation, i also found a way to unwind from code (instead of hooking up a botton to the exit icon), perhaps you could add it too. What was the way you found? Will that work for Modals as well or only items on the UINavigationController stack? Thanks for the post. This was a big help in solving a problem for me. This unwinding is included in the apple-online tutorial for beginners and I'm kind of stuck there. It is set modal and I have the controller subclasses and everything, but I can't draw from a button to that "exit" box. 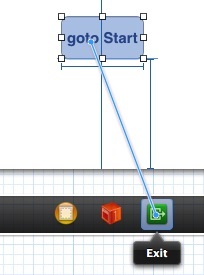 It is possible to draw from the button to the box "first responder" or to any other view/navigation controller though. Any hint? Not that I'm aware of. Did you add the reset method already as I don't think you can drag to the Exit button if you haven't already done that. i had implemented the method etc., but it didn't work out in xcode 4.52. now i changed to xcode 5 and it works. What if you are unwinding from a child navigation controller and want to go back to parent navigation controller? When I'm in child navigation controller, popping to root view only takes me back to the root view of the CHILD navigation controller. I want to go back to the parent. I think unwinding should work in this situation where as it would be very complicated to handle it in code (popping, and then having the vc you returned to pop itself and so on). Thanks Chris for the tutorial. When I unwind from the last VC to the first VC, the UIViewController dealloc: methods in the middle VC do not get invoked. Do you know what maybe the problem? Whoa. Thanks! This helped me immensely, that's awesome! 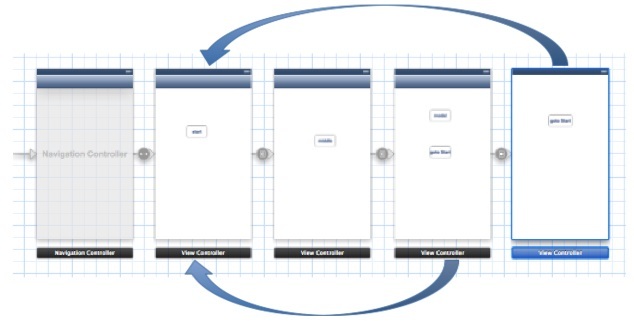 It's possible to do a unwind segue for two UIViewControllers that are not from the same UINavigationController? Sounds like you'd need two different unwind segues for this. Could you explain me more about how to use two differents unwind segues? I attach a picture, showing my storyboard, I want to do the unwind segue between Period and Batch, for go back. I don't know why the question seems like a Guest question, but it's mine.